9 months after construction work started, officials say there’s no impact on presence of flamingos in mudflats at Sewri. Environmentalists differ. Mumbai: One of the most stringent points of opposition for the much-delayed showpiece Mumbai Trans Harbour Link (MTHL), touted to be the country’s longest sea link, was that the construction would drive away the migratory flamingos that flock to the city’s mudflats every year. Now, nine months after contractors began mobilising machinery and actually started construction work, state officials and experts say, it seems to have had no impact on the presence of flamingos in the mudflats at Sewri, along the alignment of the bridge, so far. Flamingos have migrated to Mumbai in very large numbers this season close to the construction sites of the 22-km link, officials say. R.A. Rajeev, metropolitan commissioner, Mumbai Metropolitan Region Development Authority (MMRDA), said, “We don’t have an official count, but a large number of flamingos can be seen very close to the construction sites. We have instructed the contractors to be as cautious about this as possible and monitor the presence of flamingos. “During the planning process too we have incorporated suggestions from environmentalists to safeguard the mudflats of flamingos wherever feasible,” said Rajeev. Flamingos migrate to Mumbai from Gujarat’s Bhuj every winter and stay in Mumbai till May, returning to Gujarat for the breeding season. Besides the Sewri mudflats, flamingos are also seen at the mudflats of Uran, Airoli, Bhandup and sometimes at the Gorai-Marve creek. A number of enthusiasts visit Sewri between November and May to see the flamingos as the birds at mudflats are usually high in number and the location offers a great view of the vast open mudflats of the Thane creek. The 22-km trans harbour link, which was in the planning stages for more than three decades before it took off, is a significant project for the government as it will be the key connector for the proposed Navi Mumbai International Airport. The Rs 17,843-crore project has faced several environmental hurdles as it is proposed to pass through the mudflats. Environmentalists raised alarm about the possibility of the mudflats being destroyed and flamingos being driven away due to construction work, and had even demanded a change in alignment. The project ultimately received an environment clearance in 2016 and a forest clearance in 2017 on the condition that the MMRDA takes several mitigation measures. 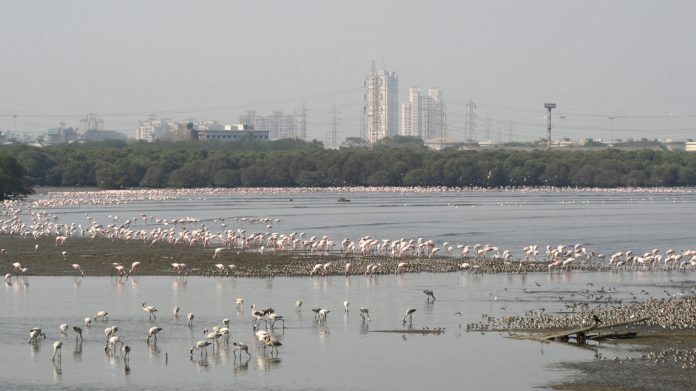 The MMRDA has roped in the Bombay Natural History Society (BNHS) to monitor the impact of construction on flamingos and other birds in the area and has promised to allocate Rs 32 crore over ten years towards efforts to mitigate any impact on flamingos. N. Vasudevan, additional principal chief conservator of forests, mangrove cell, forest department, said the number of flamingos at the Sewri mudflats this year is more than there were in the past year. “Last year, perhaps because of Cyclone Ockhi there was a disturbance in their migratory patterns. This year there are no impeding factors so they have returned to Mumbai in large numbers,” said Vasudevan. “Prime facie, the construction work does not seem to have had any impact on the flamingos,” he said. He added the numbers fluctuate every year and it’s perhaps more to do with some impact on their migration cycles and breeding patterns than the environment in Mumbai. “Birds too adapt. If during the course of construction they get disturbed, they might shift to the flamingo sanctuary or other mudflats such as Uran in Navi Mumbai and once construction work is over they might return to the Sewri mudflats,” Vasudevan said. Environmentalists are not willing to reach the same conclusion as government officials just yet. They say there have been no scientific studies on flamingos to understand their migration patterns or breeding patterns and while there is a chance that flamingos might settle down, the MTHL will cause a lot of direct and indirect damage to mudflats. Debi Goenka, an environmentalist from the Conservation Action Trust, said, “The number of visiting flamingos keeps changing every year. My organisation had tried to do a count a few years ago and found that the numbers ranged from about 7,000 to 30,000 each year. “There is no explanation for the change. The fact is that the area of mudflats is shrinking because of construction and reclamation and there is indirect damage to the habitat,” said Goenka. He said flamingos might try to identify other areas, but if there are none they might continue to flock Sewri mudflats. “It is like the housing problem in Mumbai. A person wishes to live in a nice building but if it is not available for him, he will keep living in the slum,” he said. However, overall, Goenka said the construction can cause tidal patterns to change and noise and air pollution too will be a constant issue once the bridge is operational. “I think there are a lot of unanswered questions regarding the presence of flamingos and we still need to keep our minds open,” he added.